In 2008 we were part of a rescue with more than 400 animals from a hoarder. One of them was an emu we called Yoda. When we first rescued him he was wild eyed and scared. We spent months showing him he was protected and loved and took very good care of him. He finally realized he was safe with us and started allowing us to pet him. Throughout the first year we bonded with Yoda and he would put his head on our shoulder and we would wrap our arms around his neck and snuggle him and he would snuggle us. He looked so intimidating and powerful to newcomers, but he was always gentle, sweet and kind! Yoda was amazing; he had a game he played with our peacock, Jewel. The first time I saw them play I thought that they were fighting. I was working at my desk in my office that overlooks the barnyard, so I can see all the animals while I work and I saw Yoda chasing Jewel around the barnyard and thought that it didn’t seem right. I got up from my desk and was about to run out to stop them when they stopped, turned around and then Jewel started chasing Yoda. It was like they were taking turns playing chase! They remained playmates for the rest of Yoda’s time here. Yoda liked men more than women. When our animal caretaker came to work everyday, Yoda would see his car and come running to the gate to wait for him. Yoda would follow him around and be by his side as he did his clean up and feeding of the other animals. Yoda didn’t pay much attention to women other than cuddling, but when I came into the barnyard with my hair up he was all of a sudden very impressed! Yoda would run over to me and look at me like, “hay, whatcha doin?” He would follow me around and then sit down on his elbows and creep up to me and posture like he was about to mate with me. I would explain to me that I was flattered, but married and walk away. He ultimately would grab the rubber band and pull it out of my hair, exposing that I was indeed a woman and then he would lose all interest, as he threw the rubber band at my feet. Yoda was an amazing ambassador with the at risk kids we work with. The children were always intimidated by him initially, because he looked so reptilian and imposing, but after seeing how he loved to cuddle and hearing my explanation of how he is so gentle they would gather around and pet him and stroke his fluffy head and watch him fall asleep. It would always lead to a discussion about how it feels to be judged and how unfair it is to judge someone else. Yoda was clearly different than what he looked like and so are most of the kids we work with. On Thursday morning, June 28 we woke up to Yoda coughing up blood from his mouth. We called our mobile vet immediately and were told that she was not working that day. Then we called our bird expert and were told that he was out of town for the day. 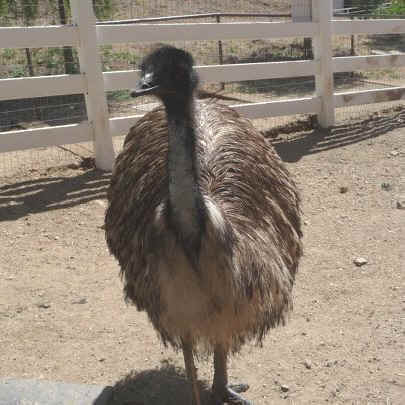 We kept calling as many hospitals as we could think of and were told over and over again that they did not work on emus, or that they were closed for the day. Finally we got a hold of one of the pet hospital we worked with in the past, that works on birds and were told that they were off for the day, but that the doctor came into the hospital just for a moment to check on some animals. She agreed to wait for us and to treat Yoda. We carried Yoda into the horse trailer after explaining to him what was going on and where we were taking him. We cooled him off so he would be more comfortable for the ride and were on our way. We arrived at the hospital and got him into an observation room right away. As the office staff brought in an estimate, we gave them permission to do whatever they deem necessary to save our Yoda and explained to them that we never make decisions for our animals based on money, only for their highest good. The doctor gave him a shot to sedate him and drew blood to send to the lab. Then they started a series of tests and x-rays to determine why he was bleeding internally. After the tests were done, there was still no clue what had caused the internal bleeding, the x-rays didn’t show any foreign object lodged inside or any holes, etc. Meanwhile we kept calling different bird vets to see if any of them might have had any additional suggestions or experience with Emu’s. We kept getting the same answer; there was nothing more we could do. We did get one vet that said that he could use a scope to look inside but not until the next day. We would have to wake Yoda up, keep him at the vets overnight, and transport him to another hospital the next morning to sedate him again for a scope exam and perhaps exploratory surgery. The bleeding wouldn’t stop though, and the doctors said that there was no way he was going to make it through the night, so they suggested that the kindest thing to do was to let him go. They urged us not to put him through more steps, that if he was to be woken up, that he could suffer a very horrible death. As I sat in the hallway and cried huge sobs of grief they let Yoda go. Yoda left in about five seconds flat; there was no hesitation on his part. It was almost impossible to get my body, heavy with grief off the ground to get to the car to drive home. There was a hole in my heart that could not be mended. Arriving home was hard because I didn’t want to see the barnyard without him, I didn’t want a Gentle Barn without Yoda. I wanted to look inside the white fence and see Yoda’s funny ballerina walk and see him run, his neck and head going one direction and his fluffy body going another. I wanted to kiss his fluffy head and hold his neck up while he fell asleep in my hands. I wanted to whisper in his ear how much I love him. I want to tell visitors on Sundays how he is a distant relative to the dinosaur and he has dinosaur feet and have the visitors gasp in excitement to meet him! How can I host a group of at risk kids without him? I will forever expect him to be standing behind me to grab my hair band and let my hair loose, exposing me for being a woman. Yoda was not just an amazing bird, not just an ambassador, not just a teacher, not just our partner healing at risk kids, but Yoda was our friend! Jay and I are heavy with grief, devastated and inconsolable. We are trying to find our way to the gratitude of having met him and the miracle of knowing him and loving him, but it will take time, because for now we just feel a big gaping hole in our barnyard and in our hearts.